Platinum boom on the horizon? Not so fast! Palladium has been the stand out performer in commodity markets over the past three years – up 160%. Palladium, mainly used in catalytic converters to control emissions from gasoline engines has been supported by a switch away from diesel vehicles and by the introduction of tighter vehicle emissions standards in China and elsewhere in the world. Investors reluctant to follow the bull market in palladium have been looking at alternative ways to bet on increasing emissions standards. The other main metal used in catalytic converters is platinum. Platinum demand has been under pressure since 2015 following the Volkswagen diesel-engine emissions cheating scandal in the US. Platinum is extremely cheap compared with palladium. 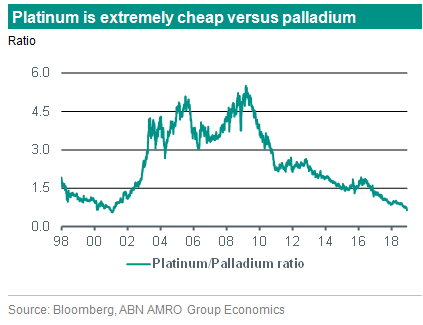 Platinum prices have declined by 17% over the past three years while the platinum/palladium ratio has declined to its lowest level since 2001. However, that of course doesn’t mean the ratio has to correct through higher platinum prices. Lower palladium prices and/or a combination of the two works just as well. Some investors it seems are backing the former. Holdings in platinum-backed ETFs have surged by 15% this year to reach a 4 year high as investors bet that carmakers will start to use the metal in petrol car catalysts. According to the World Platinum Investment Council (WPIC) a 5% substitution would mean a 14% increase in platinum demand from the automotive demand segment. However, given that catalyst demand is roughly half as important to platinum demand as it is for palladium (40% vs 79%) it may take a large switch to have a material impact on overall platinum demand. 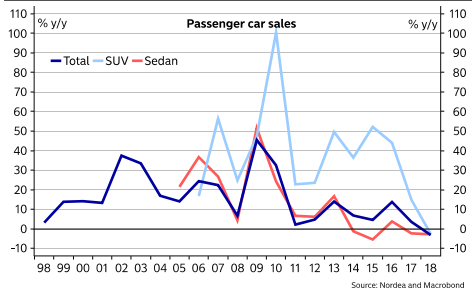 The car industry is battling declining sales in China and other markets. If auto-sales growth really does fall off a cliff (perhaps if a global recession hits) then demand for both palladium and platinum decline. The car industry is facing increasing demands to invest in electric vehicle capability to head off the perceived threat from Tesla and others who have a head start. Is now really the time that they will be tinkering with the amount of metal in their catalytic converters? History is also not on the side of price booms in metals thought essential continuing indefinitely. Just look at the price of cobalt over the past year and rhodium a decade ago. A new report by the WPIC predicts that platinum mine-level output will rise by 6% increase in 2019 to 6.46 million ounces on top of a 3% boost to recycling. 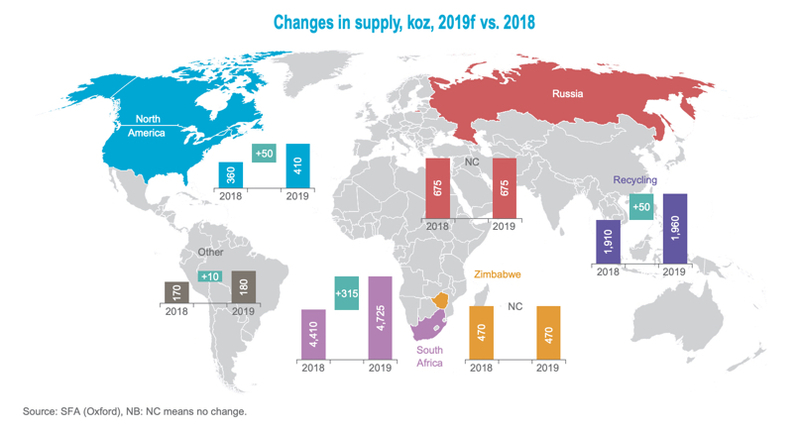 The WPIC said supply growth would come mainly from the release of material stockpiled by mines and smelters in South Africa (responsible for 70% of global mined output) during upgrades and maintenance over 2017 and 2018. If this occurs it will clearly be a one-off boost to supply. More generally platinum output from South Africa is frequently disrupted by power cuts, strikes and unrest. There seems little chance of that changing. More than 60% of South Africa’s platinum mining industry is loss-making or marginal according to Minerals Council South Africa. Labour costs have been increasing faster than inflation, whilst revenue from metal sales has been declining due to low platinum prices. Both platinum and palladium have their uses in applications other than catalytic converters. Jewellery for one but they are also held by investors as a ‘beta’ version of more commonly held precious metals like gold and silver. If gold prices come under pressure (perhaps because of reduced geopolitical tensions, lower inflation expectations and / or higher bond yields) then investor demand for palladium and platinum will also suffer. Unlike gold and to a lesser extent silver, the PGMs suffer from poor liquidity and an opaque market. The PGM group of metals (palladium, platinum, rhodium and others) are very small markets relative to gold or indeed even silver. This means that prices can go from being an investors best friend to their worst enemy in the blink of an eye. Platinum prices have been on a downward trend since 2011 frequently coming up against trend line resistance along the way. Since August prices have attempted to push up towards the trend line again (rising $100 per oz to reach $875 per oz) before failing to push past in in late February and then retracing half of that run-up in just a few days. Although speculators have recently turned net long it is going to take a break of this trend-line combined with confirmation of car-makers intent to seriously switch towards platinum for investors to run platinum higher. On 25th January 2019 it happened again. Just three years and two months after Samarco’s tailings dam failed, the world’s largest iron ore producer, Vale, saw one of its tailings dams collapse in Brazil. The death toll is expected to exceed 300. Aside from the obvious human tragedy the episode holds import lessons for commodity investments and by implication the outlook for commodity prices. As international investors scale back funding (perhaps indiscriminately in the short term) then the share price of mining companies will fall while also pushing up the cost of funding for new ventures. Note that the share price of Vale’s competitors are only rallying right now because of the potential iron ore supply deficit that Vale’s difficulties leaves behind. Governments that have long outsourced the provision of social services to the mining companies, especially in remote regions not easily accessible may be under pressure to take over where the mining companies have failed. Indeed, there may be renewed pressure for the state to have a bigger say in the mining sector and a bigger share of the spoils – a return to resource nationalism. That being said mining accounts for about 5% of Brazil’s GDP and Vale’s biggest shareholders are some of Brazil’s largest pension funds, so in Brazil at least they will be careful not to kill the golden goose. The attitude elsewhere in the world may be different. According to Amsterdam-based Responsible Mining Foundation many of the world’s largest mining companies are not able to ‘know and show’ how effectively they are addressing the risks of tailings dam failure and seepage. The foundation’s research shows that failure risks are greatest for large, steep and old tailings dams in tropical zones where seismic activity and extreme weather events can precipitate dam collapses. Although you could argue that iron ore and coal mining are the dirty heaving lifting of the mining sector there is a risk that all mining activities get tarnished with the same brush – that safety isn’t as high up the priority list and not quite as good as the mining companies say it is. The risk of future disasters remains high. 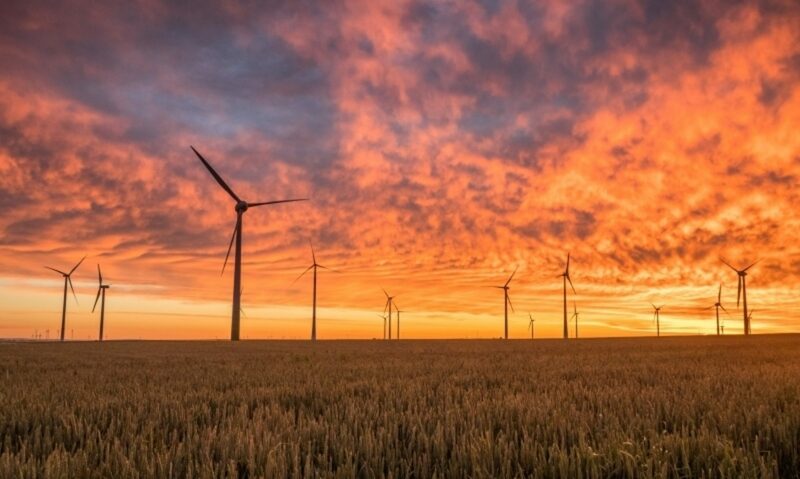 Resource companies are trying to position themselves as the suppliers of the ingredients necessary for an electric future – whether that is cobalt, vanadium or copper. Many people are not aware that commodities like cobalt and vanadium are typically by-products of much larger activities involving the extraction of more conventional commodities. Any negative impact to production of the latter will ultimately affect the former. There are some parallels between this latest disaster and the BP Deepwater Horizon accident in 2010. Just as with that corporate disaster, rivals are quick to twist the knife but at least then tighter regulations and a long and arduous approval process were introduced. Although activity dropped sharply in the aftermath, oil production in the US Gulf has since rebounded to hit record levels. There is no sign of a similar response in the mining industry following this latest disaster. But that is arguably what it must get unless it wants to face the cascade of negative outcomes outlined in this post.